After spending plenty of quality time with the new Samsung Galaxy S4 last Thursday, along with a new Samsung wireless charging pad, we left Radio City Music Hall mostly confused as to whether or not the device will actually have wireless charging out of the box. Some reps on hand said that it has the ability built into the back plate which comes on the phone in the box, while others said it would be a separate accessory. Leave it to the Wireless Power Consortium to sort it all out. 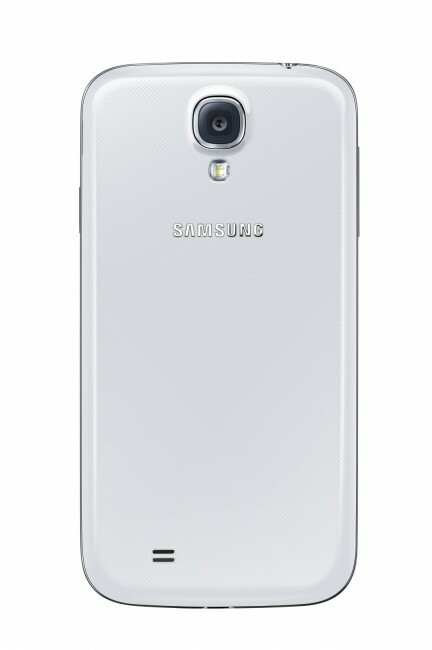 In a press release sent out this morning, they have confirmed that the Galaxy S4 does indeed support the Qi standard in wireless technology, however, it will come via “optional” back battery cover and wireless charging pad. So as in years past, we will have to rely on Samsung and carrier partners to release the wireless charging back. Otherwise, you’ll be stuck without it. NEW YORK–(BUSINESS WIRE)–The new Samsung Galaxy S4 uses the Qi wireless charging standard in its optional back battery cover and wireless charging pad accessories, as demonstrated at Samsung Unpacked 2013. The accessories are fully compatible with all Qi chargers and Qi-compatible phones. The announcement further solidifies Qi as the mobile industry’s choice for fully compatible wireless charging. Qi is backed by more than 130 leading companies of the Wireless Power Consortium (WPC) like Blackberry, ConvenientPower, Delphi Automotive Systems, Energizer, Haier Group, Hitachi Maxell HTC, Huawei, LG, Motorola, Nokia, Panasonic, Philips Electronics, Samsung, Sony, TDK Corporation, Texas Instruments, Toshiba, and Verizon Wireless. Qi cuts the last remaining cord in consumer electronics – the charging cord. Any Qi-certified device wirelessly charges using any Qi-compatible charger, regardless of brand. It’s easy, you just set your Qi-supported device on any Qi charging spot and it instantly starts charging. The Galaxy S4 is the latest addition to the rapidly expanding Qi ecosystem of mobile devices, charging accessories, charging locations, and consumer electronics with an installed base of more than 15 million units. Recently, McDonald’s began testing wireless charging with Qi-embedded tables in some of its European locations. In addition, Toyota announced that the 2013 Toyota Avalon Limited includes integrated Qi charging in the center console. The universe of Qi products includes over 170 products and Qi is the only wireless power solution directly integrated into flagship smartphones and automobiles. Qi is an open, fully flexible standard capable of evolving its technology and features to offer the best user experience while maintaining compatibility products that have the Qi logo. It offers the widest range of features to optimize user convenience and product choices: support for both inductive and resonant charging, spatial freedom, and intelligent power management. Established in December 2008, the Wireless Power Consortium’s mission is to establish Qi as the global standard for wirelessly charging electronic products. The more than 130 members of WPC include industry leaders in mobile phones, consumer electronics, batteries, semiconductors, components, wireless power technology and infrastructure such as wireless operators, furniture and automotive parts companies. Qi products are available in the United States, Asia Pacific, and Europe.